Για εκείνους που θέλουν να απολαύσουν τα αξιοθέατα και τους ήχους της πόλης Bandung, το Karmila Hotel είναι η ιδανική επιλογή. Από εδώ, οι επισκέπτες μπορούν να έχουν άμεση πρόσβαση σε όλα όσα η πόλη έχει να προσφέρει. Με την βολική του τοποθεσία, το ξενοδοχείο προσφέρει εύκολη πρόσβαση στους προορισμούς της πόλης που πρέπει οπωσδήποτε να δείτε. Το Karmila Hotel προσφέρει άψογη εξυπηρέτηση και όλες τις βασικές ανέσεις στους ενθουσιώδεις ταξιδιώτες. Οι πελάτες του ξενοδοχείου μπορούν να απολαύσουν υπέροχες δραστηριότητες όπως τα 24ωρη φύλαξη, υπηρεσία ταξί, 24ωρη ρεσεψιόν, φύλαξη αποσκευών, ασύρματη σύνδεση Wi-Fi σε δημόσιους χώρους. Όλα τα καταλύματα διαθέτουν τις απαραίτητες ανέσεις για να εξασφαλιστεί μια ασυναγώνιστη αίσθηση απόλαυσης. Εξάλλου, το ξενοδοχείο διοργανώνει πολλά ψυχαγωγικά δρώμενα έτσι ώστε να έχετε πολλά πράγματα να κάνετε κατά τη διαμονή σας. Το Karmila Hotel είναι ο ένας και μοναδικός προορισμός για εσάς που ψάχνετε ποιοτικά καταλύματα στη Bandung. the location was really great, in front off main street, around with cafe, supermarket, park, store,, and many restaurant. 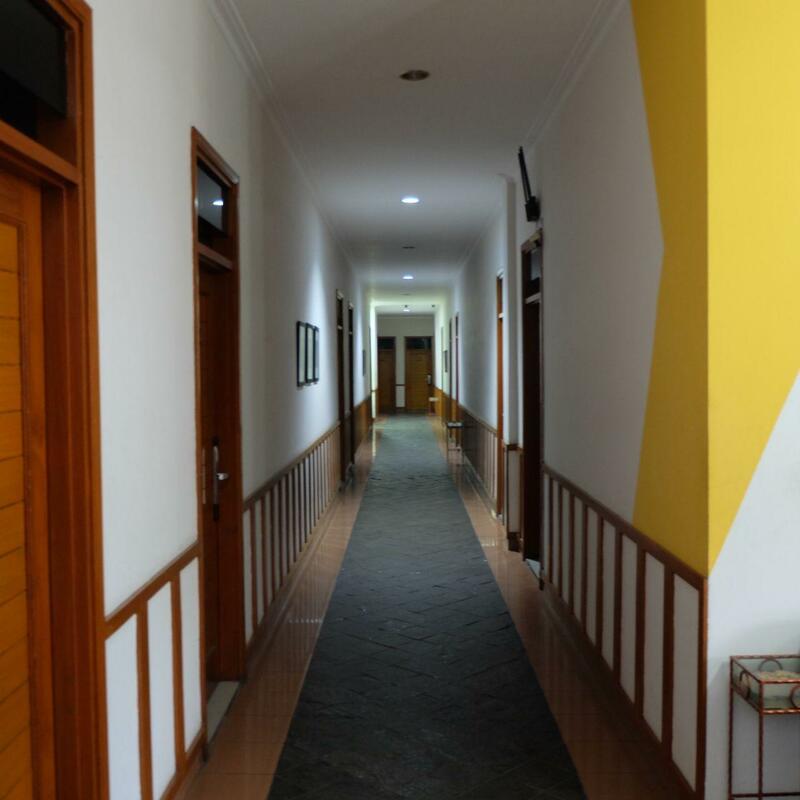 the room is good, with AC, TV Cable, hot shower, and also available toiletries in every room, and you can get free breakfast (with choice "nasi goreng", "toast bread", or "bubur ayam" . the staff also friendly, but the bathroom smells bad, and overall it's really worth it with you paid. the location is great, at the centre of Dago area, one of Bandung's happening place. But the price says it all. This is an old hotel with basic facilities for sleeping. The lobby area looks unused for a long time. No cafeteria nor restaurant. The layout of the hotel is kind of awkward. You have to walk through the parking lot to get to the elevator. There is only one elevator by the way. Hot water was not running smoothly, sometimes is there, sometimes is not. You can also hear the neighbour's dog barking all night from the room. The nasi goreng for breakfast which they delivered to the room was not good at all. Staff excellent service polite and helpful. But beds not so good many rooms with squeeky beds due to boards. Also the rooms on the side with neighbors dogs bark different times in the night disturb sleep totally. But hotel location perfect. Superindo supermarket 1 min walk away. Front taman radio with delicious cheap Roadside Madura sate and walking distance to restaurants cafe snd small mall. One thing that you must concern when you stay in. You must remind and make sure to the receptionist everyday to clean your room up. One day when i stayed there, they forgot to clean my room up. Thankfully, after a little complaining, the cleaning service team came and cleaned my room up. First time I stayed in this hotel . 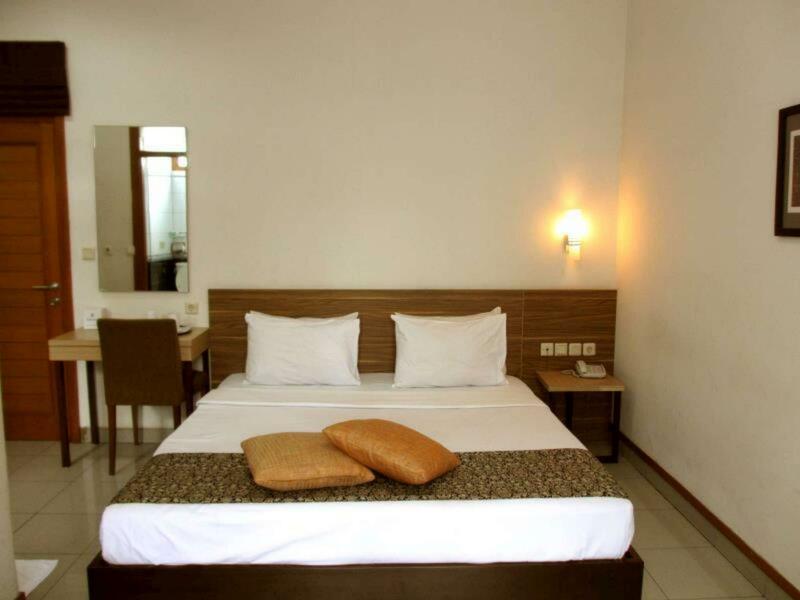 This hotel is great for traveling in bandung very close to spot tourism area. Room facilities is standard but very comfortable to rest. Don't hope to wifi in the room and breakfast only one choice. I think this hotel need to wifi facilities in the room. You have to use the gate for the hospital to access the hotel. Mountaineer restaurants or cafeterias. Balcony had cigarette leftovers.. rooms were large but not clean. Most rooms have large balcony as well. one good thing about this place is the location. no wifi in the room, bed sheets were dirty, there was a very bad smell in the room, toilet didnt flush, constrction next door started at 7am with the loud sound of hammer waking us up. it was so loud that you could feel the vibration in the room, on a bed. staff do not speak english. and also they messed up our breakfast. Staff are very friendly. Wifi in the room. Near to fast food restaurant and super market. Near Golden Money Changer and Kartika Sari. Take GRAB will only cost you 13K. Cheap, clean, and staff very helpful. Cheap especially for peak season. Parking was easy. Breakfast was taken to the room. It was comfortable enough. We stayed at 2 single beds room with toilet/washroom. Hotel is very clean with lifts and located in front of main road. Our room is not noisy since located at the back. Suitable for solo travellers families on a budget. Very clean n nice room (even dustbin is white! ), all the light are white n bright, so even small dirt will be seen clearly. But the room is still seems clean! It is pity that garments seems a little bit old with some mark on it. The staff is really nice! Just somehow feel not really secure if u r solo female traveler. But if you have friend or family I think no problem. Another thing to consider is, the single bed is 90cm wide. It was my second time spent the night here. Always had good experience here. The staff are very friendly. The room quite big and comfortable for family (me and my mom), with that very affordable price. I spent the new year's eve at the hotel and they gave me a compliment such as drinks and snacks. Just a little concern, i saw ants in the bathroom and the table with food. But overall, it's okay for an old budget hotel. Doubt that you can find a better location and room in the same price range. Clean, breakfast included, drinking water dispenser in each floor, quick check in and out. Only downside is it can get noisy from the whistles and traffic in front of the hotel as it is a busy street. Maybe get a room on the back end of the hall if you really need absolute silence. 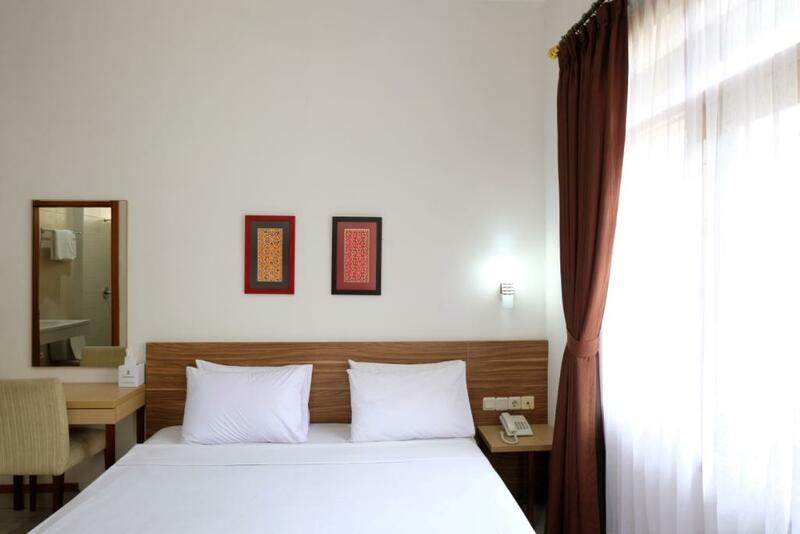 I would highly recommend this for travelers that want a no-fuss and clean room in downtown Bandung. Went on peak season and room was ready when we checked in. Hotel was basic. Maybe about two stars top but it was clean and well located. The mall is only 8mins walk. Upside down museum was about 10mins walk. Alcohol shop was next door along with supermarket and KFC. This hotel is in Bandung main road, local call it jalan dago (dago street). Walking distance to factory outlet, many restaurant, supermarket, fast food, and many food hawkers. You can stop bus or mini bus (angkot), even taxi in front of this hotel to many Bandung interest place. Got very reasonable price, clean room, quite big room for the price, comfortable. 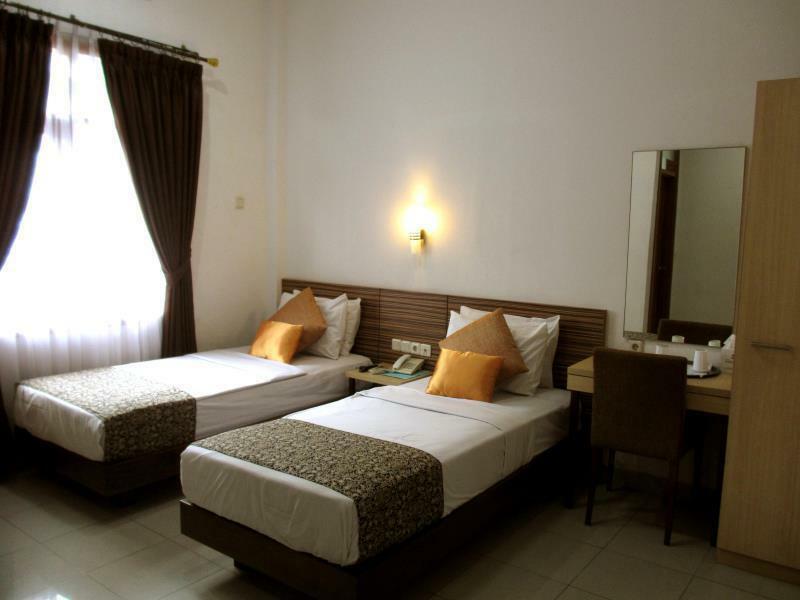 This is just old ordinary hotel, dont expect modern international chain hotel in this hotel ambience. Staff very polite. Fast checkin and checkout. Nothing to worry about reception. Breakfast just a plate of fried rice, just enough for us. Will come back someday. Σιδηροδρομικός Σταθμός Bandung στα 1.66 χλμ.